The Philippine Statistics Authority (PSA) issued a Notice to the Public regarding National ID Registration. Initially, the target for the dry run of national identification system was this December 2018. However, it didn’t push through yet. The Philippine Statistics Authority, as the primary implementing agency to carry out the provisions of Republic Act No. 11055 or the Philippine Identification System Act (PhilSys Act), has not yet started the registration of applicants for the PhilID. 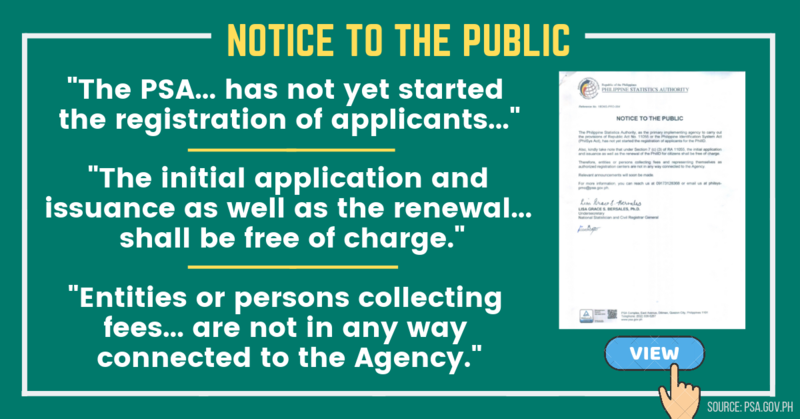 Also, kindly take note that under Section 7 (c) (3) of RA 11055, the initial application and issuance as well as the renewal of the PhilID for citizens shall be free of charge. Therefore, entities or persons collecting fees and representing themselves as authorized registration centers are not in any way connected to the Agency. Relevant announcements will soon be made. Ang Philippine Statistics Authority (PSA), bilang pangunahing Ahensya na magpapatupad ng mga probisyon ng Republic Act No. 11055 o Philippine Identification System Act (PhilSys Act), ay hindi pa nagsisimula ng pagrehistrong mga aplikante para sa PhilID. Nakasaad sa Section 7 (c) (3) ng Batas na ang paunang aplikasyon at pag isyu ng PhilID sa mga Pilipino ay walang bayad o libre. Dahil dito, ang mga grupo o tao na nangongolekta ng bayad at nagpapakilalang awtorisadong magrehistro ay hindi taga-PSA o hindi konektado sa PSA. Magpapalabas ng mahalagang anunsyo ang PSA tungkol dito.